To practice good forest management, woodlot owners must be able to identify the tree species on their woodlot, understand how they grow, and how growth can be influenced. A tree is made up of roots, a trunk or stem, and a crown. Each of these parts play an important role in the tree’s growth and development. The roots anchor the tree to the ground and absorb moisture and nutrients from the surrounding soil. 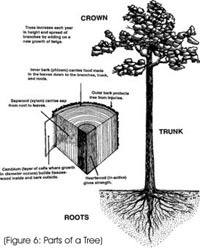 The trunk supports the crown and is the link between the roots and the leaves for transporting water and nutrients. Water, nutrients, the sun’s energy, and gases from the air combine in the leaves to produce the food needed for survival. An inactive wood that does not have a role in the production of food for the tree. It gives strength to the roots, trunk and branches. Made up of xylem tissue, this active wood carries water and nutrients from the roots to the leaves or needles in the crown. The layer of cells where diameter growth occurs. It is a sheath of tissue located under the bark next to the sapwood. The inside layer closest to the center of the tree produces wood. The outside layer produces bark. Consisting of tissue called phloem, it carries food made in the leaves and needles down to the branches, trunk, and roots. Protects the tree from injury. Roots, stems and branches lengthen and thicken as the tree grows. Silviculture treatments can influence the amount and rate of these changes. For example, appropriate use of early thinning can result in a stand growing to harvest size up to 20 years before an untreated stand. 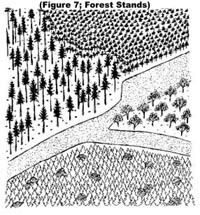 To assist in management planning and in implementing silvicultural treatments, a forest is divided into units called “stands” ( Figure 7). Stands are groups of trees that show enough similarities in species, age, height, and density to form obvious separate units. Stands are described using three terms: age, percentage of softwood and hardwood trees, and finally the developmental stage of the stand. Even-aged stands are groups of trees with maximum age differences of 10 to 20 years. They are established after trees in an area are removed over a short period of time by fire, insect infestations and disease, wind or cutting. Uneven-aged stands are trees with at least three age classes and have a variation in heights and diameters. Stands are also classified by stage of development (Figure 8). This is determined based on average height and age of the trees within the stand. A forest is a complex and dynamic community in which trees grow and develop from seedlings through maturity. A number of physical and biological factors continually influence the growth and development of forests and must be understood before you can begin to practice good forestry. Although the effect of these factors may be more easily understood when discussed individually (e.g., soils), it is more complicated when all factors are considered together as an ecosystem. Nevertheless, an appreciation of their existence and effect on the forest will help you understand the reasons behind good silvicultural practices. When managing a woodlot, it is important to know which biological factors can be changed and which physical factors cannot. For example, since the soil cannot be easily changed, the species you plant and/or regeneration you try to encourage must be compatible with the soil type. You could try a number of silvicultural treatments and still not achieve maximum growth if the trees are not suited to the soil. A Forest Ecosystem Classification guide was published by the Nova Forest Alliance (Keys et al. 2003 )for use in central Nova Scotia. In this guide forest ecosystems are grouped based on tree species, ground vegetation, soil type and other features of the site. This guide allows woodlot owners and forestry professionals to group similar sites together. Once similar sites are identified owners can better address hazards and operational limitations associated with these ecosystems. This classification makes management outcomes more predictable and thus sustainable. Experience is also very important. Woodlot owners who observe local conditions can provide valuable practical knowledge in addition to general silviculture principles. The ability of a forest to grow is related directly to physical site factors. Favourable physical factors create better land capability rating and a better response to silvicultural treatments. Land capability is determined by comparing the total age of a healthy dominant tree to its height. Better site qualities produce taller trees at any given age. For example, a 70 year old tree which is 23 metres (75') tall is probably growing on a better site than the same 70 year old tree that is only 16 metres (52') tall. Sites lower than capability 4 (capable of 4 m3/ha/yr) (0.7 cds/ac/yr) are not generally worth spending a lot of time and money on. The potential of these sites to respond to silvicultural treatments is very low. In growing from seedling to maturity, trees constantly compete for sunlight, moisture, food, and space. The healthier, vigorous trees on better sites soon overtop their neighbours and become dominant and codominant members of the stand. 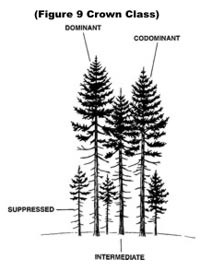 The remaining trees develop into intermediate or suppressed positions within the stand (Figure 9). Genetically superior trees and more vigorous species have an advantage and often quickly establish superior height positions in the forest canopy. Inferior trees are at a distinct disadvantage. Density is usually expressed as number of trees per unit area (hectare or acre). It reflects the degree of crowding of trees in a stand. Stocking is a relative term usually expressed as a percentage, which refers to amount of growing space used by trees. An area with enough trees to use all the available growing space is considered 100% stocked. An area where only half of the available growing space is occupied by trees is 50% stocked. During stand establishment, thousands of trees may germinate, but that number will decrease through natural mortality as the stand ages. 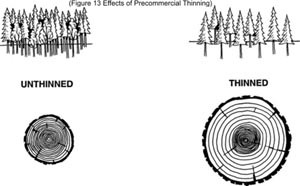 The higher the initial density, the greater the competition, resulting in many trees being eliminated from the stand. At maturity, the available sunlight, moisture, nutrients, and space will be used by fewer, larger trees. When a tree dies, it creates an opening in the forest canopy. As it decays, nutrients stored in the foliage and wood fibre are released into the soil. In a young stand, the opening is filled by the branches of the surrounding trees. In a mature stand the open space provides an area where regeneration can establish. Throughout its life, a tree must have enough space to spread its crown and roots in proportion to its size to reach maximum growth. If there are too many trees competing for the same space and the trees will be smaller. If there are not enough trees, the existing trees will develop large limbs and extensive crowns. Much of the growing space will be utilized by undesirable, non-commercial species. This also results in an overall reduction of stand growth. A species’ ability to survive in a dense stand depends on its height growth and to a greater extent, its tolerance of shade. Tolerant trees are able to survive and grow under various shade conditions. Intolerant trees cannot persist for very long in shade. It is important to consider this when planning silviculture operations. If your objective is to produce a stand of tolerant trees, a shelterwood or selection harvest method should be used rather than a clearcut. Module 2 provides more information on harvesting systems. Species composition will vary throughout the life of a stand, depending on stand density and age. As stands get older intolerant species generally die and are replaced by more tolerant species which are better able to compete and grow in the reduced sunlight. As trees age they go through three major phases of development - immaturity, maturity, and decline. 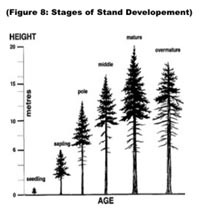 Through each phase, changes occur in the rate of height, diameter and volume growth; stand density, stocking and development, and species composition (Figure 10 A). Trees grow in height from the terminal bud, if the terminal leader is not damaged. The greatest rate of height growth happens during the immature stage (Figure 10 B). Although a tree will continue to grow in total height, the rate will decrease as the tree matures. The final height that a healthy, vigorous tree reaches depends on the site capability. The better the site the taller a tree will be at a given age. Each year, a tree produces an annual ring made up of a light and dark band of wood. The light band occurs during the spring and early summer. The dark bands are produced in late summer and early fall. These rings occur in the trunk, roots, rootlets, branches and twigs of all trees (Figure 11). Annual rings are very important in forestry since they reflect the history of a tree or stand. A tree’s age can be determined by counting the rings. The rate of diameter growth throughout a tree’s life can be seen in the various widths of the rings. When a tree is suppressed, the rings are narrow and when the tree is growing well and free of competition, the rings are wide. The rate of diameter growth is directly related to stocking. Generally, the greater the stocking the slower the rate of diameter growth. Diameter growth is reduced by suppression from the side and from above. 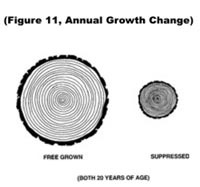 If a tree is released from competition, the rate of diameter growth will normally increase. Constant competition throughout the tree’s life will result in a smaller diameter tree at maturity, regardless of the site capability. If a tree is suppressed on one side only, the diameter growth will normally be less on the suppressed side. For example, trees along the edge of a field will usually have more diameter growth on the side facing the field, while the forested side will have less. Because of the competition in a stand, trees of the same age may exhibit a wide variation in diameters. A tree with a large diameter could be the same age or younger than a neighbouring tree with a smaller diameter. The rate of volume growth, like height and diameter growth, is generally greater during the early stages of a tree’s development. Since volume growth is dependent upon both height and diameter growth, factors that influence height and diameter will also affect the volume. Stand volume is directly related to stocking. 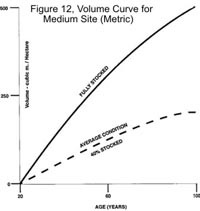 That is, stand volume will increase as stocking increases (Figure 12) because the site is being more fully utilized. As mentioned earlier, growth and development of a stand is significantly affected by competition with other trees. In some cases, competition is beneficial; such as in hardwood or white spruce stands where density will minimize excessive limbiness. In dense stands, competition from neighbouring trees slows the growth and development of the stand (Figure 13). To enhance the growth and development of your woodlot, competition must be adjusted through spacing treatments. Precommercial thinnings are treatments used to achieve desired spacing between trees. With the exception of planting, most silvicultural approaches to stand management involve altering the existing spacing. Reducing competition by thinning allows the remaining trees to grow to the site’s capability. Thus, more merchantable wood will be produced sooner. The extra space will also allow for the growth of larger trees that will have a higher value, such as sawlogs. Thinning treatments remove undesirable trees and free the best ones from competition. Undesirable trees are those that are diseased and/or damaged, unwanted species, and ones that are crowding better quality trees. Which trees are undesirable will vary with each situation. Therefore, it is important to always know what type of tree species or forest product you want to encourage on your woodlot. Thinning is covered in more detail in Module 3.